Home News Reports Did Times Now cover up Fake News by spreading more Fake News? Did Times Now cover up Fake News by spreading more Fake News? Times Now at about 11:06 AM on Tuesday dished out a breaking news claiming that the dates of the Karnataka elections were 12th May (for polling) and 18th May (for counting). This claim was made by Times Now before the Election Commission had officially announced the dates. The information at Times Now was purportedly picked up by BJP’s IT head Amit Malviya who at about 11:08 AM tweeted the dates from his personal twitter account. This caused a media storm after journalists without much fact check questioned as to how did the BJP gain access to the dates before they were announced by the Election Commission. The “Breaking News” was soon proven wrong by the Election Commission itself as the actual dates of the polls are 12th May (for polling) and 15th May (for counting). Even though Amit Malviya was being questioned left right and centre by journalists and politicians, most would have felt that Times Now would not be among those doing so as after all, it was possibly the one responsible for spreading the fake news in the first place. In the above video the channel’s correspondent is seen attacking Malviya by asking him to answer whether he had any prior information regarding the dates and termed it a “very serious breach of security and sanctity of the election commission”. He then decided to brazen things out by claiming that a “reputable news organisation” was unfairly being blamed and indicated which news organisation it was by stating, “it is our job to get from sources whatever we can and break it first. We cannot be faulted for that” (sic). 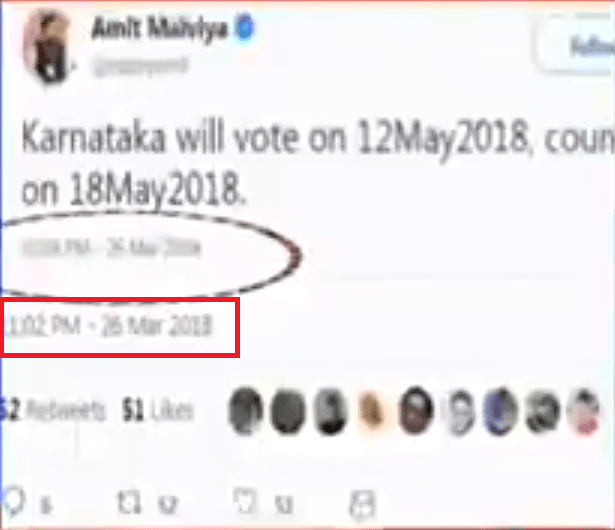 Things though took an unexpected turn when the reporter claimed that Amit Malviya’s tweet where he predicted the dates were from “last night” that is 26th March or 12 hours before the dates were officially announced by the election commission. So going by Times Now’s bizarre narrative, Amit Malviya tweeted his claims on 26th night and promptly deleted it. He later decided to post the exact same tweet about 12 hours later and in both cases propagated the wrong information. Following the media controversy, Malviya has written a letter to the Election Commission where he has explicitly mentioned just one tweet posted at 11:08 AM which he claims was based on the news break by “Times Now”. Hence there are two possible explanations regarding this mysterious affair. If Times Now is indeed right and Malviya posted a tweet on the 26th night then why has it flown under the radar, which includes him not getting attacked by the opposition politicians for the same? Also, he promptly deleted the tweet last night by sensing his mistake, then why did he commit a similar one about 12 hours later? At the onset itself, this theory sounds ridiculous and fantastical. If Times Now isn’t right, then did it try to maliciously spread the fake news in order to try and cover up for its own blunder? Did it try and reproduce a doctored screenshot of the said tweet with a malicious timestamp? OpIndia reached out to Amit Malviya regarding this matter and he, in turn, denied making any such tweet last night. The question thus arises: Did TimesNow doctor a tweet (either photoshop or change the time settings on the device from which the screenshot was being taken)? And if it did, why is the entire fraternity silent? Why are the questions being directed at Malviya and not the news agency which first spread false information, and then seems to have spread another fake news to wash its hands of the initial false information? One hopes that in light of this development, the election commission launches a detailed investigation to separate truth from fiction.